The empire of Vijayanagara was the largest and most effective polity of pre-colonial south India. A source of political inspiration and imagination, at its peak it included parts of Karnataka, Andhra Pradesh, Tamil Nadu, and Maharashtra, This book brings together last thirty years of research and scholarship in art and archaeology of Vijayanagara. Divided into two equal parts, the first focuses on Hampi, a World Heritage Site. It examines Vijayanagara scholarship, archaeological work, heritage site management, conservation, photography, epigraphy, sculptures, and sacred topography. The second links the city with the wider regions of the empire. It discusses the development of regional art and architecture, Vijayanagara and post Vijayanagara paintings, Shaivite ascetic iconography, and Vijayanagara coinage. South India under Vijayanagara highlights the recent multidimensional and interdisciplinary approach in the academia. The contributors, leading academics from around the world, use textual material to corroborate the data provided by archaeology and raise new questions. Richly illustrated with photographs, maps, line drawings, layout plans, and colour plates, this book will interest scholars and students of medieval Indian history archaeology, art, architecture, and religion, particularly those concerned with Vijayanagara Empire and south India. Anila Verghese is Principal of Sophia College for Women, Mumbai. Her publications include Religious Traditions at Vijayanagara (1995), Archaeology, Art and Religion (2000), and Monumental Legacy: Hampi (2001). Anna L. Dallapiccola is former Professor of Indian Art at the South Asia Institute of Heidelberg University and Honorary Professor at Edinburgh University. Her publications include Vijayanagara Sculpture (1998) with Anila Verghese, King, Court and Capital (2003) with C.T.M. Kotraiah, and The Great Platform at Vijayanagara (2010). The heritage site of Hampi, the erstwhile city of Vijayanagara that served as the capital of the Vijayanagara Empire from the mid-fourteenth century to 1565 CE, has been the focus of much scholarly interest during the past 30 years. The multidimensional and interdisciplinary work at Hampi since the late 1970S and early 1980s has brought to- gether a community of scholars, both from India and abroad. Their interest in the art and archaeology of the capital gradually led to a greater awareness of and work on the developments within the wider area of the empire. This volume gathers together the wealth of scholarship that has gone into Vijayanagara studies during the past 25-30 years. The first section of the book concentrates on research work done in the capital city while the second half highlights facets of the work done within the wider context. As the title of the volume sug- gests, the focus is on art and archaeology and not political history. This collection of essays is indirectly the fruit of a conference, held in Mumbai in January 2007, at which most of the eminent 'Vijayanagara scholars' participated. In addition to the fourteen papers presented at this conference, a number of scholars who could not be present have also contributed chapters to this volume. Besides the introduction and 24 chapters in this volume, a glossary of Indian terms has been provided for the general reader. The select bibliography included here contains a list of books and articles on Vijayanagara art and archaeology that have been published during the last 25-30 years. Most of these essays are the result of a couple of decades or more of rigorous work that their authors have put into the field of Vijayanagara studies. At the same time, there are also chapters by newer entrants into this ever-widening circle of the Vijayanagara scholarly community. The editors, who have been part of this community for a quarter century, are grateful to all those who have contributed to this volume, many of whom are long-standing colleagues and friends. This volume would not have been possible without the help and support of many individuals and institutions: Vatsa Kumar, former president of the Kannada Vrinda, Houston (Texas, USA), was the moving force for bringing together Vijayanagara scholars to share their findings with the general public at seminars and conferences held in USA and India. It has been his dream that a volume with contributions by all these scholars be published and we are grateful to him for his dynamic initiative as well as unstinting support to this venture. We thank Sophia College, Mumbai, and its management for providing the venue for the conference 'South India under Vijayanagara: Recent Research in Art and Archaeology', which was the platform at which many of these papers were read and discussed. We are especially grateful to Swarupa Kamat and her colleagues and student volunteers of the history department of Sophia College who hosted this conference and worked tirelessly for many months to make it a grand academic success. We thank the University of Mumbai for adopting the conference as one of its Sesquicentennial Year Academic Programmes. Some funding for the conference came both from the University of Mumbai as well as from the University Grants Commission. Special mention must be made of the Luigi and Laura Dallapiccola Foundation (Edinburgh, UK) for the very generous financial assistance that made the conference and this volume a reality. We are grateful to the directors of the Karnataka Directorate of Archaeology and Museums and to their officers and staff at Hampi for the hospitality extended to us and many other Vi- jayanagara scholars at the Directorate's site camp. Indeed, without this base at Hampi, many of us could not have carried out our field research work. We owe a special debt of gratitude to the directors of the Vijayanagara Research Project (VRP), John M. Fritz and George Michell, who have been always encouraging and extremely generous in sharing not only their immense knowledge but also the data gathered by VRP, including maps and drawings. Michael Tomlan, of Cornell University, provided assistance for transcribing some of the papers read at the Mumbai Conference on Vijayanagara; we thank him as well as his student, Ashima Krishna, who did this laborious task. We appreciate the help rendered by Surendra Kumar of Hampi who very kindly provided us with a scanned copy of 'The Hampi World Heritage Area Management Authority Act', passed by the Government of Karnataka in 2002-2003. This volume would not have been possible but for the support of many others who have worked behind the scene; among them, we specially acknowledge, with warm gratitude, Ananda Amritmahal for her meticulous copy- editing on the manuscript and Rashna Poncha for the layout and art-work for the same, prior to submission. Finally we thank our publisher, Oxford University Press, New Delhi, both for accepting to publish this volume and for all the cooperation and help extended to us. Vijayanagara City was sacked and deserted after the disastrous defeat of the Vijayanagara armies in the battle of Talikota by the confederacy of the Deccan Sultans in 1565 CE. Within a hundred years of this military debacle, the Vijayanagara Empire gradually disintegrated, with its feudatories, the Nayakas, asserting their independence of imperial authority However, even though the earliest modem historical work on Vijayanagara, Robert Sewell’s seminal work, is titled A Forgotten Empire,’ neither the city of Vijayanagara nor the empire named after it had disappeared from notice or attention. They are mentioned in the writings of travelers to the Deccan and south India of the sixteenth and seventeenth centuries and they aroused scholarly interests from the beginnings of modern Indian historiography. The chapters in this volume reflect a fairly recent trend in Vijayanagara studies which has to be located within the rich canvas of zoo years and more of Vijayanagara historiography. Looking at the broad spectrum of Vijayanagara historiography, chronologically the following approaches have been dominant at different points of time: the Orientalist, nationalist, and regionalist approaches, the segmentary statehood approach and the more recent material-cultural approach. The interest of European scholars in the Vijayanagara Empire and its capital, Vijayanagara City, the present-day ‘Hampi’, dates from around i8oo when the area around Hampi came under British rule as a part of the Ceded Districts. Hampi, on the river Tungabhadra, was at the northern limits of the Ceded Districts. The importance of this region, adjoining the territories of the Nizam and the Marathas, was well understood by the British. Thomas Munro, an enlightened Orientalist, who was well versed in Persian and in Indian languages, was appointed as the collector of these districts in October x8oo, a post he held for the next seven years. It was here that Munro introduced the famous land revenue settlement made directly with the peasants, the Ryotwari Settlement. Munro’s enlightened administration not only brought stability to the region, but must have also aroused scholarly interest in the region’s historical background. The earliest, though unpublished, account of Hampi was by the antiquarian Colonel Cohn Mackenzie, later Surveyor-General of India. Travelling through the Deccan and south India in the last years of the eighteenth century, Mackenzie noted temples and forts, copied inscriptions and collected manuscripts in the vernacular languages. Mackenzie was aided by a set of learned Indians who copied and translated inscriptions and ‘traditional histories’ in the local languages. He visited Hampi-Vijayanagara in the winter months of 1799-4800, on which occasion he described the overall layout of the site and attempted to identil3’ various structures, irrigation works, and fortifications. He also provided the earliest map of this site. The sketches and water colours that he had prepared of certain monuments survive to this day in the India Office Collection of the British library London. The first published accounts of Vijayanagara and its monuments appeared in the course of the nineteenth century. The earliest of these is probably the partial account of Vijayanagara presented to the English-speaking world by Mark Wilks in 1810. Wilks’s work was prepared while he was the English East India Company’s ‘Resident’ at the court of the Wodeyar king of Mysore, after this dynasty had been reinstalled in 1799 on the throne seized from them some 40 years before by Haidar Ali Khan. The basis of Wilks’s reconstruction was an eighteenth- century Kannada language work by a Brahmin scholar known as Pootia Pundit? In 1836, the description of Hampi-Vijayanagara by the Orientalist scholar H.H. Wilson appeared, accompanying the translation of twelve inscriptions from the site by E.G. Ravenshaw, which marks the beginnings of investigation into the epigraphical records of the capitaL3 In 1900 Robert Sewell’s pioneering work, A Forgotten Empire, was published. This was the earliest attempt to give a comprehensive picture of the empire and its capital from its foundation to its downfall. Sewell’s book provided the foundation on which a regular history of the Vijayanagara Empire could be constructed. The year 1917 saw the publication of the first official guide-book on the capital city, A.H. Long Hurst’s Hampi Ruins: Described and Illustrated .4 These British writers sought to devise a historical past not for the sake of pure knowing, but for the purpose of controlling a subject people whose past was to be so constructed as to make British rule a necessity as well as a virtue. The Orientalist approach indirectly justified British rule. The publications of these British writers, especially Sewell, had opened the eyes of scholars to the great heritage of the Vijayanagara Empire. The Orientalist approach to the writing of Vijayanagara history was bound to change as Indians seized control of the writing of their own history. The earliest and most influential Indian successor to Sewell was S. Krishnaswami Aiyangar. In his opinion, the Vijayanagara Empire was founded at a very crucial period in the history of south India and played an important part in arresting the Muslim expansion in the south and in fostering the Hindu religion and traditional culture. This view was upheld, either directly or indirectly, in the writings of B. Suryanarayan Row, K.A. Nilakanta Sastri7 and others. During this period, although the focus continued to be primarily on the political history of Vijayanagara, the earliest attempts to understand the social and cultural life under Vijayanagara and the economic conditions that prevailed were also made by the historians BA. Sale tore and TV. Mahalingam respectively. Thus, in the first half of the twentieth century, during the Indian national movement, these nationalist historians and historical writings highlighted the role of Vijayanagara as a bulwark against foreign rule and an alien culture and as the protector of Hindu religion and culture. During the freedom struggle, various regional and linguistic sentiments were also appealed to, in order to awaken the masses against British rule. This was true both of the Kannada and Telugu-speaking peoples. 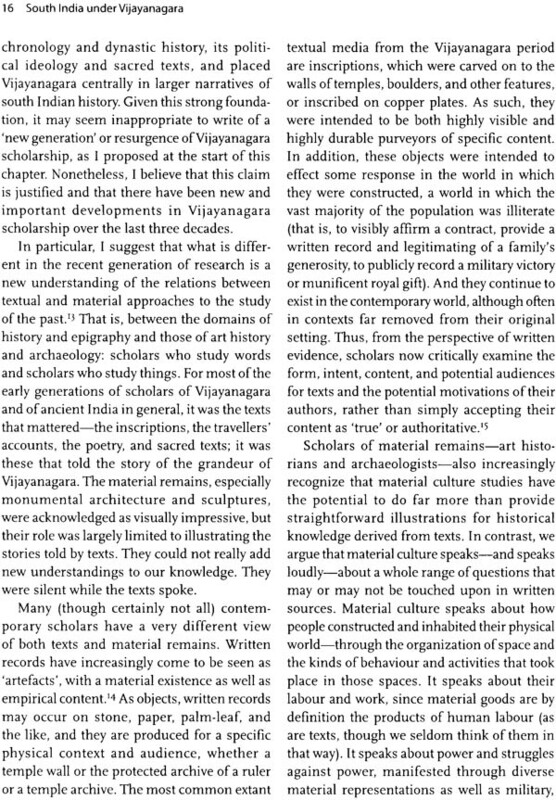 Therefore, many scholars took a regionalist approach to the writing of Vijayanagara history. The Karnataka Vidya Vardhaka Sangha, founded in i88o, focused on the Kannada-speaking people in the then Bombay Presidency with the dream of unifying all Kannada-speaking regions into a single provincial unit. The Kannada Sahitya Parishat, founded in 1915, concentrated on promoting Kannada language and literature, while the Karnataka Sabha, established in 1916, pursued the unification efforts politically. Simultaneously, the Telugu-speaking people formed the Andhra Mahasabha and pressed for the formation of a linguistic state of their own. Both groups laid claims to the Bellary District, in which Hampi-Vijayanagara is located. To strengthen their positions, both groups put forth theories about the origins of the Vijayanagara Empire and of its founders, the Sangama brothers, in support of their viewpoints. The supporters of the Telugu origin theory, led by N. Venkatramanayya, proposed that the Sangamas were originally officers of the Kakatiyas of Warangal. This view was challenged by B.A. Sale tore, Henry Heras, and others who claimed that the founders of the Vijayanagara polity had served under the Hoysala rulers of Karnataka . Thus, up to the mid-twentieth century, historiography on Vijayanagara had passed through three broad stages: European Orientalists opened the field by identifying its major literary and inscriptional sources and its broad chronology. They were succeeded by scholars like Krishnaswami Aiyangar and others who added greatly to the knowledge of Vijayanagara history; but, in their somewhat different ways, these historians highlighted an anti-Muslim and nationalistic bias in Vijayanagara’s history. Vijayanagara history then passed into a third phase when scholars like Sale tore and Venkataramanayya explored new sources of Vijayanagara history and raised questions regarding the origins of this empire; but, they sought in this history a basis for the regional patriotisms of the Kannada and Telugu speaking peoples. One feature common to all the three approaches is that they all focused on textual and inscriptional sources for the reconstruction of Vijayanagara history. A more recent, and rather controversial, approach to Vijayanagara historiography came from a group of historians from outside India as highlighted in the Peasant State and Society in Medieval South India by the American historian Burton Stein.’2 Borrowing from anthropology, Stein applied a radical new model to interpreting the political structure of Vijayanagara and the preceding Chola state—which he called the segmentary state. In a nutshell, Stein claimed that, outside the core territory of the empire, the Vijayanagara monarchs exercised only a ‘ritual sovereignty’ and that even at the height of their power in the early sixteenth century, beyond the heartland of their empire where their power and the resources commanded were formidable, the rayas were content with the homage and occasional tribute of distant chiefs. Moreover, they tolerated, if they did not actually foster, the creation by their nominal agents of compact territories—known as the ‘nayaka states’—whose competition later helped to destroy the empire. While some modern scholars appreciated this approach as being a refreshingly new way of looking at the Vijayanagara polity many others fiercely criticized it as being a one-sided and incomplete approach that could not adequately answer certain questions. The research of the Japanese scholar, Noboru Karashima,’ especially of Tamil Nadu under Vijayanagara rule, also adopts a feudal interpretation of the Vijayanagara polity particularly in the sixteenth century, one that focused upon the relations between kings and local lordship and the appearance of complex landholding rights. Till about 3o-odd years ago, little historical work had been done on Vijayanagara using the archaeological data or the material remains available of this period. However, since the late 19705 there has been an upsurge of interest in Vijayanagara archaeology The focus of attention has been particularly on the city of Vijayanagara, and for good reason, since the ruins of the city form, perhaps, the most impressive and extensive medieval site in India, affording a wealth of data to the archaeologist and historian. Some work has also been done during the last few years in studying the monuments and material remains in the wider area of the empire in order to understand Vijayanagara history, art, and culture. This recent material-cultural approach to Vijayanagara historiography has not only focused on the material remains, it has also been interdisciplinary and collaborative in nature. 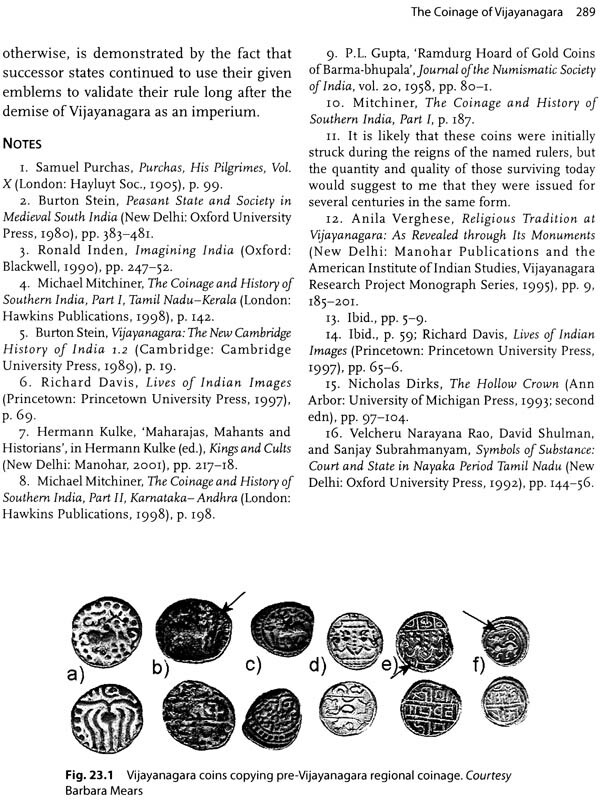 The last three decades of research on Vijyanagara has involved historians, epigraphists, art historians, religious historians, geographers, geologists, astronomers, anthropologists, and archaeologists who were interested in understanding questions concerning the nature, organization, and history of the Vijayanagara Empire from the fourteenth to the seventeenth century as the largest and most effective polity in pre-colonial south India. This resulted in a remarlble collaborative effort. 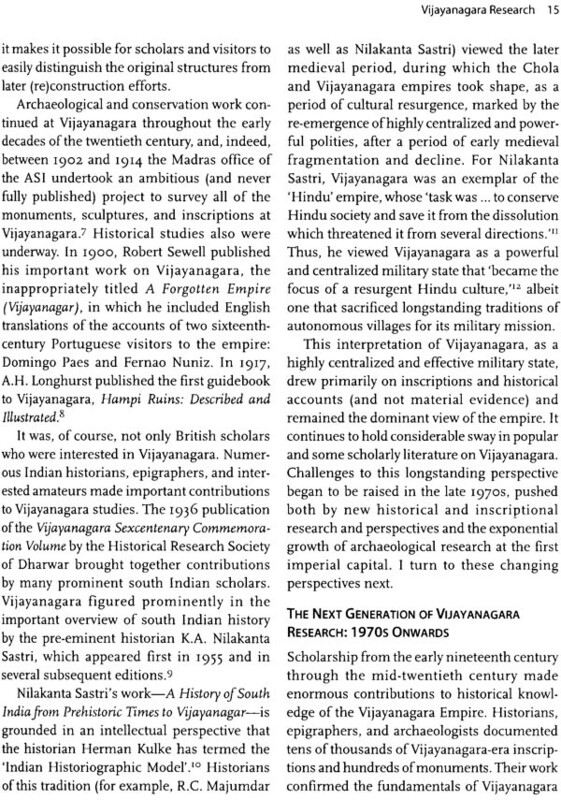 The approach of this collaborative community of Vijayanagara scholarship has differed from that of earlier historians. For most of the early generations of scholars on Vijayanagara it was the texts that mattered—whether they were inscriptions, travelers’ accounts, poetic works, sacred texts, chronicles, and so forth. It was these that told the story of the lost grandeur of the Vijayanagara Empire. In their view, the material remains might have been impressive, but their role was largely secondary in nature, serving merely to illustrate the stories told by the texts. 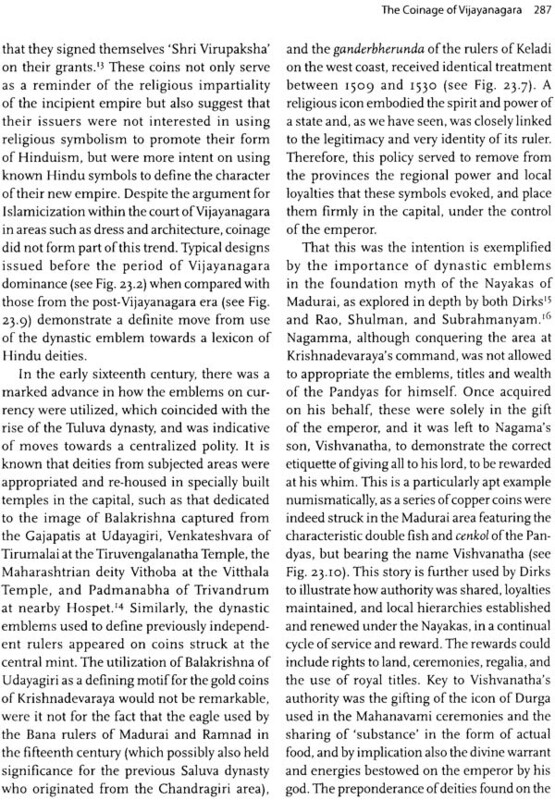 However, for the scholars engaged in the recent approach to the study of Vijayanagara, the material remains, whether the monuments, sculptures, pottery, or even carvings on the rocks, speak loudly. They raise a whole range of questions not touched upon in the written sources: about the organization and construct of space and the kinds of activities that took place in the spaces that were created; about labour and work; about structures of power and methods of seeking legitimation of power won by force; about beliefs and religious practices; of how food was grown and craft products manufactured; of the processes of cultural assimilation, synthesis, transformation, creation, and dissemination that were at work resulting in a great mobility of ideas, of content, and form and of new trends in art and architecture, religious practices, and courtly styles. The textual material is not ignored by these scholars; it is used as corroborative and supportive to the data provided by the archaeological remains. This interest, beginning initially with the remains of the present-day Hampi, the erstwhile city of Vijayanagara, the capital of the mighty Vijayanagara Empire, and later widening its scope to the larger area of the empire, was sparked off by various factors: in the early 1970s the Archaeological Survey of India (ASI) published the up-to-date guidebook on Hampi by D. Devakunjari. At more or less the same time, the Indian-French team of Vasundhara and Pierre Filliozat was working at Hampi in preparing an architectural and inscriptional study of the Vitthala Temple and incidentally of other aspects related to the site. More importantly, in ‘975, the then Union Minister for Education, Nurul Hasan, a noted historian and archaeologist, dedared three medieval sites as national archaeological projects. These were Hampi, Fatehpur-Sikri, and Champanir By the late 1970S, extensive archaeological excavations, as well as conservation efforts were initiated at Hampi by ASI and the Karnataka Directorate of Archaeology and Museums (KDAM). In the early 198os, to the site came a team of international scholars, who not only collaborated with the Indian archaeologists but who were soon joined by many others, both from India and abroad. In 1983, a number of the scholars working on Hampi met at a seminar in Germany at the South Asia Institute, Heidelberg University. The deliberations and discussions at this august gathering resulted in the publication of the two-volume book, Vijayanagara: City and Empire,T5 that included essays on the new insights and discoveries made about the site within the wider context of the empire; it also provided the most up-to-date bibliography and a list of all published inscriptions on Vijayanagara. The present volume gathers together valuable material on the work done at Hampi, and within the wider area of the Vijayanagara Empire, since the Heidelberg seminar. The contributors include some of the leading scholars who have been at the forefront of the new and interdisciplinary approach to Vijayanagara studies during the past 30 years as well as younger scholars and conservationists who have entered the field more recently. This volume presents a wide range of chapters dealing with archaeology, both excavation as well as surface archaeology, epigraphy, heritage management and conservation, architecture, sculpture, painting, and numismatics, themes recurrent in the art of the period and even with sacred topography. It is divided into two equal parts. The first section concentrates on the site of Hampi and the second on the wider area of the empire. 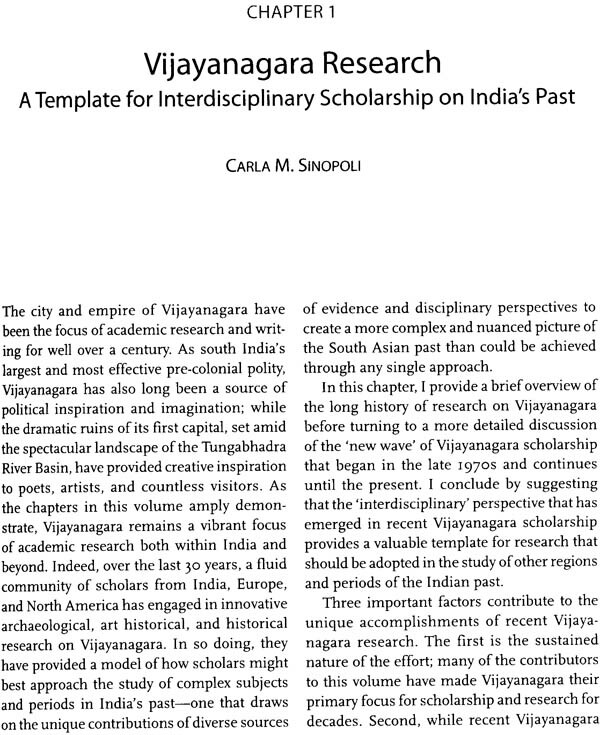 The first section begins with Carla M. Sinopoli’s brilliant analysis—of the interdisciplinary approach that has made Vijayanagara scholarship of the last 25—30 years so unique and special and a viable model for work at other sites. 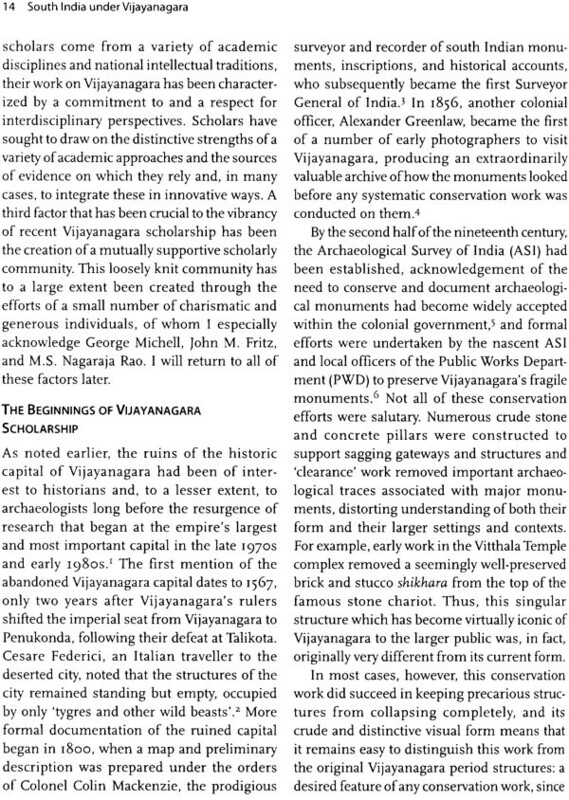 Sinopoli, who has been a part of the Vijayanagara community of scholars from the early 198os, highlights three aspects that have made the ‘new wave’ of Vijayanagara scholarship so distinct: the sustained nature of the work; the respect for interdisciplinary perspectives; and the creation of a mutually supportive scholarly community. She mentions in particular the contribution of stalwarts such as M.S. Nagaraja Rao, John M. Fritz, and George Michell, as well as that of many other scholars. She describes some of the new insights into Vijayanagara history offered by this recent scholarship that has combined a serious engagement with both material remains and written records: for example, new understandings of the complex history of the empire as a whole and of religious practices and beliefs in the Vijayanagara period in south India; important insights into the agricultural economies and practices that provided the economic foundations for urban growth and imperial expansion, and about communication and movement across the Vijayanagara landscape and so forth. In the next chapter, M.S. Nagaraja Rao, former Director of the KDAM and also former Director General of the ASI, describes the archaeological work done at Hampi since the late 1970s. This includes surface archaeology and mapping, excavations, conservation work, epigraphical studies, and publications on an extensive scale. He also mentions in brief the present status of the work at the site. 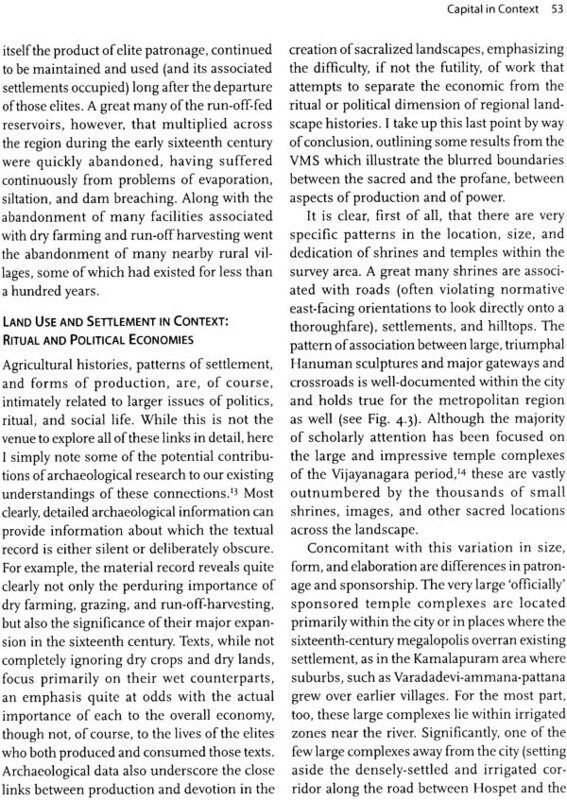 John M. Fritz, Director of the Vijayanagara Research Project (VRP) that has been largely instrumental in bringing Hampi to the attention of a wide audience worldwide, describes in Chapter 3, VRP’s work of surface archaeology especially mapping the entire site of Hampi. He gives an overview of the work done and the ways in which these maps would be made available as a resource to present and future researchers. Kathleen D. Morrison, who joined the community of Vijayanagara scholars as a young student in the early 1980s and who, along with Carla M. Sinopoli, pioneered the Vijayanagara Metropolitan Survey (VMS), focuses in her chapter on the regional setting of the city of Vijayanagara. She gives a brief account of the work of the VMS, which was directed toward understanding the city of Vijayanagara within its regional context, particularly the landscapes of production that surrounded the city. 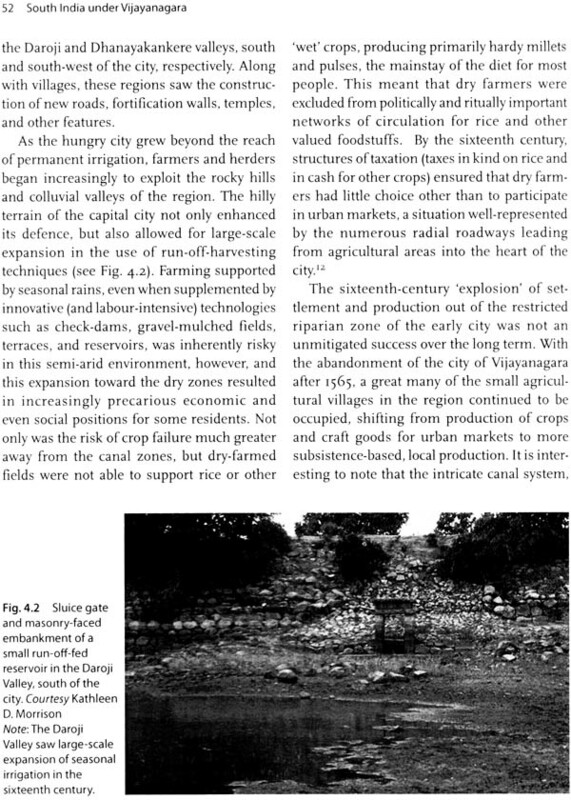 Though the project originally centered on developing a sense of the forms and organization of craft goods and agriculture surrounding the city, eventually through the survey much was also learned about the longer-term historical development of the regional landscape from about 2ooo BCE to the present. While the chapters by Nagaraja Rao, Fritz, and Morrison are related to the archaeology of Hampi and the wider metropolitan region, the next three chapters centre on the vital question of conservation of the fragile heritage of Hampi and its environs. Nalini Thakur, architectural conservationist, who was directly involved with the drawing up of an Integrated Management Plan (IMP) for the Hampi region, in her chapter shares the salient features of this plan. Thakur believes that every heritage site has the potential of unifying the community, the heritage place and its historic dimension into one programme. According to her, the IMP for Hampi attempts to link international requirements with national directions. She also envisages a role for scholars and academics, besides the local communities, in site management activities. B. Sarath Chandra, the next contributor in this section, was also involved in the drawing up of the IMP for the Hampi region in 2004—2oo5. More importantly, as a consultant for the Hampi World Heritage Area Management Authority (HWHAMA), he has been active at the ground level in trying to implement this plan. In his chapter, he describes briefly the working of the HWHAMA since its inception as well as its future plans of action. Ache Narain Lambah, architectural conservationist, discusses various issues related to the conservation of Hampi and its fragile heritage that is now facing serious threats. In particular, she shares her experiences of a private—public partnership engaged in the conservation of one monument at Hampi, namely, the Chandramauleshvara Temple site. Next, George Michell, pioneering scholar in this new wave of research on Vijayanagara City and Empire and Director of the VRP, takes the reader through some of the earliest photographs of the site and gives valuable insights into lessons that we can learn from these. He particularly focuses on some of the photographs of Alexander Green law dating back to i86, which reveal that during the past 150 years, valuable architectural and archaeological features have disappeared at the site. Michell states that today, more than at any time since its destruction in 1565, the Hampi Vijayanagara site is under siege; having being ransacked and burnt, and then abandoned and neglected, it is now threatened by unbridled development. He makes an impassioned plea that before the site entirely falls victim to the conflicting pressures of different groups, it is imperative that we try to learn what happened to the monuments in the past, as revealed through these early photographs, so that we may manage them better in the future. In the following chapter, S. Rajasekhara, epigraphist and historian, throws new light on the Hampi monuments through his study of inscriptions, both those published earlier as well as the ones that have been discovered during the recent past. 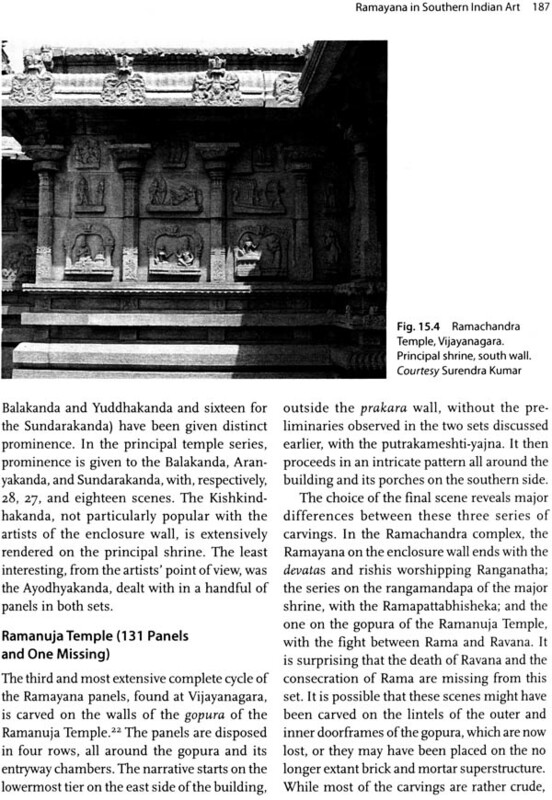 The next two chapters in Section 1, deal with specific and very important monuments within the Royal Centre of Hampi. Anna L. Dallapiccola’s chapter focuses on the sculptures of a unique monument that has been generally referred to as the Great Platform or the ‘Mahanavami Platform’. She describes in depth the structural phases of this monument’s construction, the materials used, and techniques of carving, as well as the themes and compositional strategies. According to Dallapiccola, the crucial location of this monument in the layout of the Royal Centre, its unusual architectural character, and its unique sculptural programme, totally devoid of sacred imagery, make it a most fascinating structure whose purpose, although the link with the Mahanavami celebrations has been often highlighted, has not yet been filly understood. One of the structures that have been exposed through the excavations carried out during the last 30 years at Hampi is the magnificent stepped tank, built of blue-green chlorite schist, instead of the grey granite typically used at the site. Phillip B. Wagoner, in his chapter on this tank, demonstrates the Chalukyan origins of this tank and he argues powerfully that this tank was reassembled at the present site in the last phase of Vijayanagara as the capital city Lastly, Anna Verghese describes the sacred topography of Hampi-Vijayanagara and how it grew and evolved as well as the different ways in which sacred spaces in this large and complex site can be viewed. According to her, interwoven into the urban and heritage landscape of Hampi-Vijayanagara is a 1sacred geography’, some of which pre-dates the empire. However, much of this sacred geography was deliberately invented or highlighted during the empire-period by the king and courtly elite. Into this survey, Verghese weaves in the natural features of this sacred topography, the foundation myth, the Ramayana tradition, the great cults that were imported to the site during the empire-period, as well as the sacred spaces of minority groups. Section II links the city with the wider regions of the empire. While some of the chapters here focus on both Vijayanagara city and the empire, other chapters concentrate on one or other regional or local development. In addition, there are the chapters which deal with specific themes related to the art of this period; there is also one on coinage; while the last chapter gives a personal overview of Vijayanagara art. Alexandra Mack’s chapter, the first in this section, examines temple inscriptions from Vijayanagara and two pilgrimage centres, Tirupati-Tirumalai and Tiruvannamalai. It reveals that temple inscriptions record the exchanges and interplay between groups diachronically, revealing which group had power at different times, and in different places. Also, temples often served as backdrops for displays of kingly power, since kings not only built temples, they could notably make donations, such as tax remittances, that others could not. However, while this was very evident in the case of temples at the capital city and at the great pilgrimage site of Tirupati-Tirumalai, Tiruvannamalai remained to a large extent out of the main focus of power expressions and negotiations throughout the Vijayanagara period, receiving more donations from local rulers than from the imperial elite. 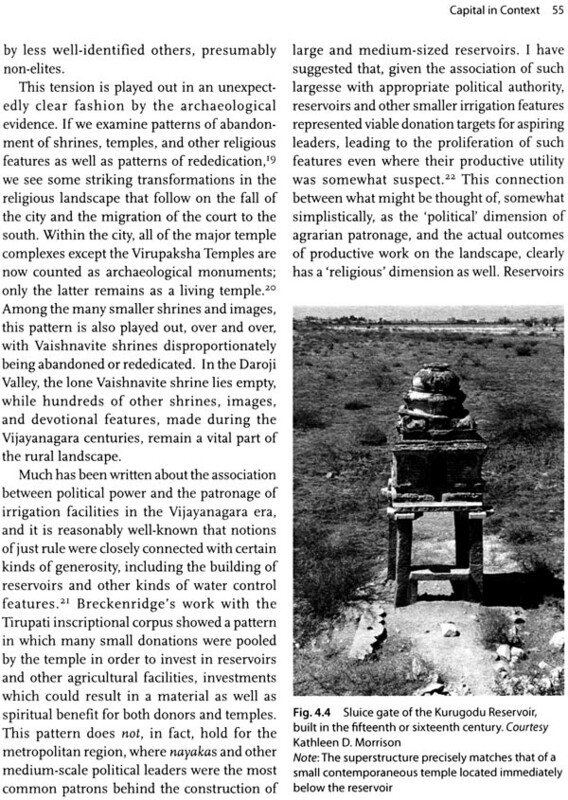 Anila Varghese’s chapter on the development of the gopura in south Indian temple art, demonstrates that the gopura type temple gateway is a Chola invention and that this type of structure had already attained a large measure of maturity well before the foundation of Vijayanagara. However, in the pre-Vijayanagara phase, gopura construction was restricted to a small part of southern India, and there was a break in its construction after the early fourteenth century. The Vijayanagara polity, by adopting the Chola-Pandya paradigm as the quintessential imperial idiom, not only revived the gopura structure after a too-year gap in its construction, but made it a pan-south Indian feature of temple architecture. The contribution of the Vijayanagara period foreshadow the efflorescence of gopura architecture under the Tamil Nayakas. Anna L. Dallapiccola, in her chapter on the Ramayana in the art of southern India, briefly tracehe tradition of narratives in the pre-Vijayanagara period and then focuses on developments of the Vijayanagara period, both in the capital and elsewhere. She demonstrates how in the early narrative sculpted cycles, the Ramayana, Krishnacharita, and Mahabharata were fairly equally represented. Gradually, the Mahabharata lost its popularity, and the artists concentrated on the Ramayana and the Bhagavata Purana. During the Vijayanagara period the story of Rama, which combines both the martial theme and the king seen as the upholder of dharma, protector of the earth and of his citizens became especially popular, with numberless depictions of the Ramayana appearing in sculptures and painting. During the Vijayanagara period, there was undoubtedly a fair degree of uniformity in architectural traditions within the empire. However, regional variations did exist. In his well-documented and beautifully illustrated chapter, John Henry Rice, describes the chaturmukha Jaina temples of the Kanara Coast and indicates that these unique temples were an architectural assertion of the autonomy of local rulers under the over-arching hegemony of Vijayanagara rule. 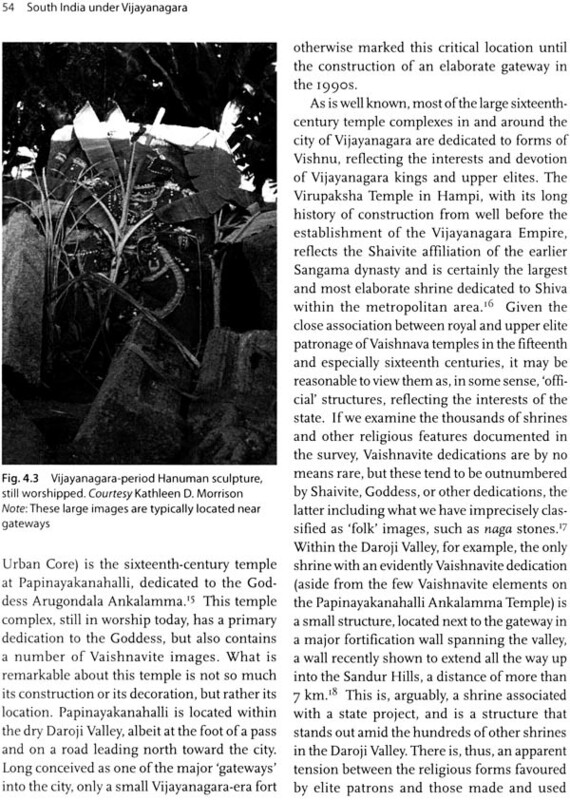 In her chapter on the Vidyashankara Temple at Sringeri, Pumima Srikrishna dwells on the uniqueness of this Vijayanagara-period temple. She not only highlights its art and architecture, but also reveals the philosophical underpinnings of its distinct style. In the sixteenth century, various regional authorities began to assert their independence from the imperial Vijayanagara rule. Among these were the Yelahanka Nada Prabhus of the area around modern Bengaluru. 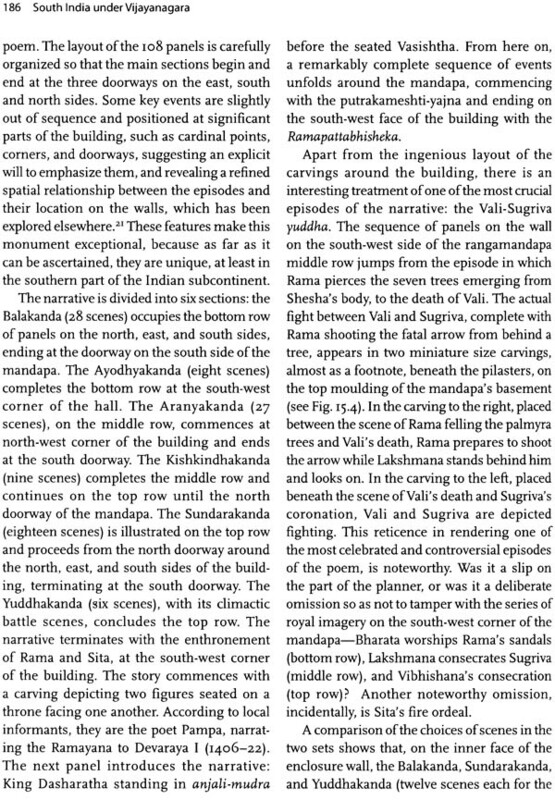 S.K Aruni highlights the uniqueness of the art and architecture of these local rulers, especially in their depictions of certain narrative themes such as the Ramayana, Bhagavata-Purana, and the Girija-kalyana. Richard Shaw, in his chapter, throws light on the rendering of Shaivite ascetics, namely, the Siddhas, in a variety of exotic poses, found in the sculptural repertoire of the Vijayanagara period. He especially focuses on such sculptures that appear at Srisailam, Hampi Vijayanagara, and Sringeri. Crispin Bran foot examines several interrelated trends in the depiction of royal or elite figures across southern India during the Vijayanagara-Nayaka period. First, there is the changing depiction of these images from small, low reliefs to life-size images, sculpted fully in the round. This led to a greater degree of detail in a figure, allowing the viewer to perceive these images as portrait images of known individuals. Third, a distinction maybe made between images that are ‘viewed’, that engage in profile with other figures within a narrative relief scene, and those that are ‘viewing’, that face forwards to look directly at the beholdet These trends culminate in the later sixteenth and seventeenth century images of life-size royalty in prominent positions within a temple, that boldly engage the viewers, both devotees and passing deities in procession. According to Bran foot, these sculptures also provide important evidence about the changed notion of god—king relationships in early modern South Asia. Brigitte Khan Majlis, drawing from her study of the textiles of this period, describes a motif that occurs not only in textiles, but also in sculpture of the pre-Vijayanagara and Vijayanagara periods, namely, the gandabherunda or the double-headed eagle. This motif appears both in the zoomorphic as well as in the anthropomorphic forms as is revealed by selected examples from a wide range of sites. 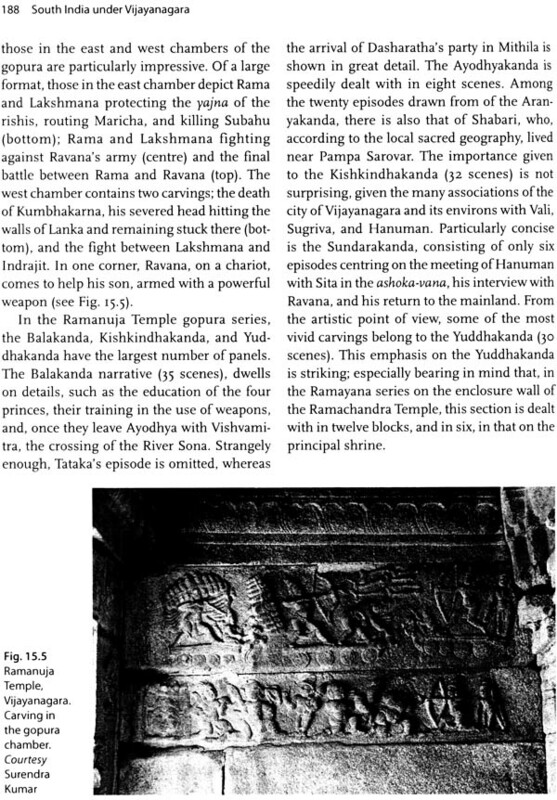 In her chapter on painting, Anna L. Dallapiccola highlights the salient features of Vijayanagara and Nayaka paintings, as revealed in extant examples that have been cited. More importantly, she focuses on the paintings of the Virupaksha Temple at Hampi and argues powerfully and convincingly that these are not of the Vijayanagara period. She also gives a tentative dating to this important set of murals. 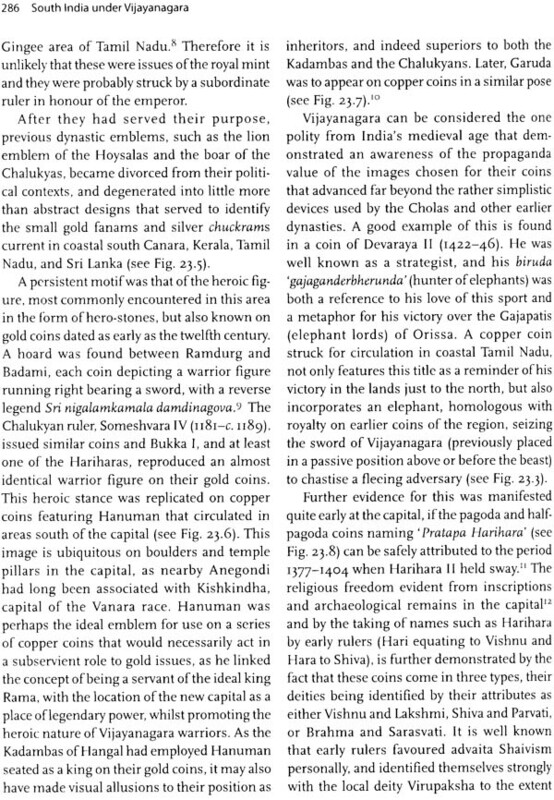 Barbara Mears, in her chapter on coinage, examines select Vijayanagara and Nayaka coins, emphasizing on the images as well as the legends on them. 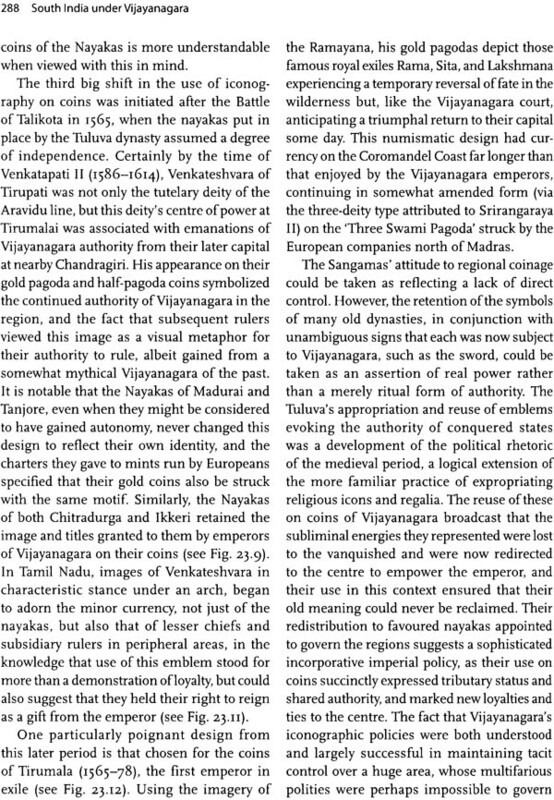 By studying these in depth, Mears argues that that the rulers of Vijayanagara were not just using their coins to signify they had an empire, but to broadcast and implant important concepts about its nature and ruling ethos throughout the south. 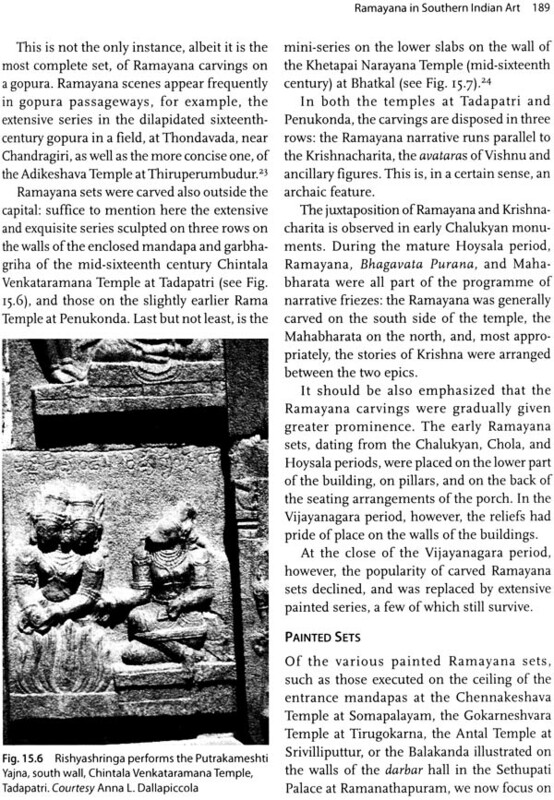 In the final chapter in this section, Choodamani Nandagopal looks at Vijayanagara art from the retrospective point of view, reflecting the processes of restoration, revival, and renaissance. Nandagopal positions the study of Vijayanagara art in the following order: first, the ‘period eye’—kaatadarthuna—wherein religion played a significant role; second, is the ‘devotional eye’—divyadarshana—wherein the process of transformation took place through devotion; and finally, the ‘artistic eye’—kaladarshana—where the rituals and divine experience were transformed into music, dance, sculpture, painting, and architecture. The chapters in Section II of the volume reveal that, borrowing from earlier traditions and adding new elements, a uniquely ‘Vijayanagaran’ art and architecture was created, which has impacted southern Indian art and culture right up to modern times. At the same time, it becomes evident that while there was undoubtedly an ‘official’ style and a certain degree of uniformity in architecture, sculpture, and painting throughout the realm under Vijayanagara, while strong regional tendencies and variations also co-existed side by side. This volume, with its collection of chapters by 21 scholars, including both senior researchers, who have spent some decades on Vijayanagara studies, as well as more recent entrants into this field, reveals many facets of the type of work that has been done both at Hampi as well as within the wider area of the Vijayanagara Empire during the past 25—30 years. No doubt, much has been done at Hampi; however, much still remains to be done and of the greatest urgency is the conservation of the fragile heritage of the site and its metropolitan region. As for the wider area of the Vijayanagara Empire, although beginnings have been made in understanding its art, architecture, and cultural history, there is great scope for further research, especially in-depth studies of specific monuments and or regional development.